The theme of this year's conference was "making connections". So it was only right that the first official events of conference were full of exactly that. Each each conference starts with an ice cream social. 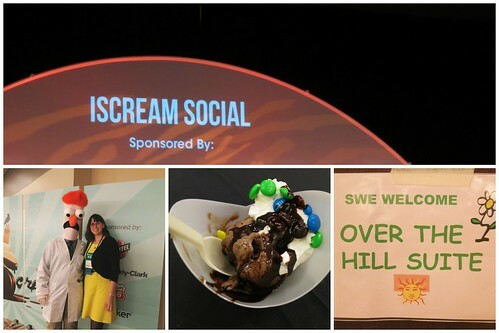 This year they decided to take it up a notch by making it the iScream social--complete with a costume contest. I'll admit, I cringed when I read the announcement. After all, as a group of professionals, is that really what we want to come up on google when people search for "Society of Women Engineers"? A bunch of people in costumes? And the conference organizers were making sure it would come up--they had a social media friendly photo booth at the ready and were encouraging liberal use of a conference specific hashtag on Twitter and facebook. I still have mixed feelings on the costume contest, but I will say this. The costumes people chose? Were pretty cool. One woman had a cardboard Bumblebee costume which she could kneel and lay forward in and it actually formed a car. That was some stellar costume engineering! As you can see in the photo above another woman made a Beaker costume. There was a group which did a 20+ person ensemble costume with characters from the Wizard of Oz. Kimberly Clark, a group of probably 30+ people, dressed up as their Brand/Division superheros with coordinating shirts and capes. So there were Huggies superheros and Kleenex superheros. And our SWE president was a suffragette. As the iScream social was winding down one of the women I'd met on the food tour invited me to the "Over the Hill Suite". Now this is something of a secret club. I'd heard rumors of it before, but never been invited. It's a group of older SWE members, many past presidents of the national organization, who reserve a large suite, provide drinks, and invite people in to chat, catch up, and make new friends. I had a lovely time and was able to connect with a woman who may be providing leadership coaching for our section next year. It made for a long day (I didn't leave their suite until after 11), but it was well worth it.